Cinnamon swirl bread filled with cream cheese filling and topped with vanilla icing and purple, green and gold for Mardi Gras. In south Louisiana, we have Mardi Gras at the beginning of the New Year. It changes from year to year. It can be in February, that is early, and in March. This year (when this is posted) it falls on February 13. If you haven't heard of Mardi Gras, here is a little history. Mardi Gras in French means Fat Tuesday, it is the day before Ash Wednesday, where people feast and party before Lent where people give up something during that time. The first recorded Mardi Gras goes back to 1699. The traditions vary from region to region but in New Orleans the major partying starts on Lundi Gras and ends on midnight Mardi Gras. 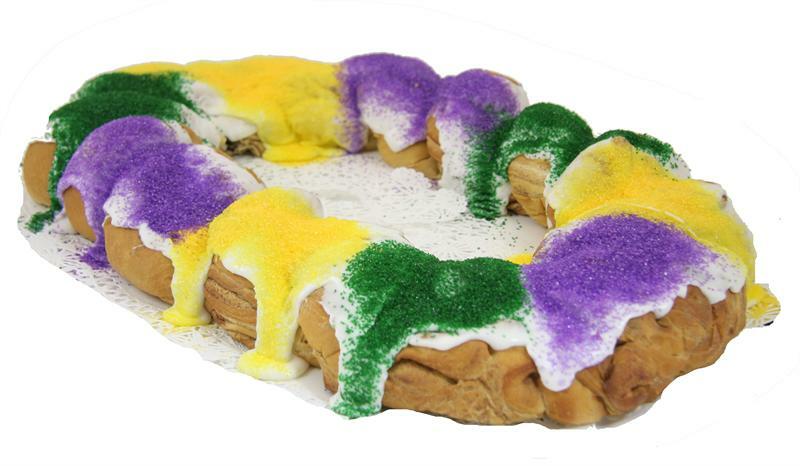 During the time of Mardi Gras traditional you eat of King Cake, Red Beans and Rice and Crawfish Boils. There are parades where they throw out candy, beads, doubloons, toys, masks and one crew they throw painted coconuts. This bread is inspired by King Cake that I have been consuming all of my life. This doesn't have the baby in, which is traditional if you get the baby you have to purchase the next King Cake. 1. Combine yeast, 1/2 teaspoon sugar and 1/4 warm water. Whisk together and let bloom for about 10 minutes until foamy. 2. While the yeast is blooming, heat milk and butter until better is almost fully melted. Let milk and butter to cool for 5 minutes, you do not want to scotching hot milk. 3. In a large bowl, combine 4 cups of bread flour, 1/2 cup sugar and salt. Add bloomed yeast and stir until well combined. Pour cooled milk-butter into the flour mixture until a ball can be formed. 4. Sprinkle a little flour on a clean surface, knead dough for 2 to 3 minutes. One sign the dough is alive, while you knead it will return it shape. 5. Place dough into a greased bowl and cover for 1 1/2 to 2 hours, until it doubles in size. 6. Sprinkle a little more flour, flatten dough out then fold in the sides then fold the top like an envelope. Press into a square and let it rest for about 10 minutes. 6. While the dough is resting again, combine cinnamon, sugar and pinch of sea salt. Set aside. Cream together cream cheese, vanilla extract, 2 tablespoons sugar and last pinch of sea salt. Set aside. 7. Butter a 9 inch by 5 inch loaf pan. 8. Rolling dough out into a 12 inch by 22 inch rectangle. If the dough starts to shrink, pull down out to keep it shape. 9. Spread cream cheese mixture over dough evenly leaving at least 1 inch from the edge then sprinkle over cinnamon sugar. Pat cinnamon sugar into the cream cheese then roll the dough starting in the middle and making the way up. Pinch the seams and the ends closed then place into prepared pan. 10. Cover pan and let proof for 2 hours until it doubles and is at least 2 inches above the pan. 11. Preheat oven to 350 degrees. Cut slits into the top, at least 3. Place onto a cookie sheet and bake in the oven for 30 to 45 minutes, checking after it bakes for 20 minutes. If it starts to brown really fast, cover loosely with aluminum foil. Bake until the loaf stand up and sounds hollow if tapped with fingers. Let cool on a wired rack in the pan for 15 minutes remove and let cool completely on a wired rack completely. I recommend overnight to make sure it is completely cooled. 12. Whisk together confectioners' sugar, milk, vanilla extract and pinch of sea salt until thick. Drizzle glaze over cooled bread then sprinkle colored sugar in the pattern purple, green and gold. Let the glaze set for 20 to 30 minutes. What a fun and delicious bread! So yummy! This looks so colorful and beautiful! We celebrate 3 King's Day. I love me some king cake bread! This looks amazing! This bread looks so fun and festive! And I love anything with cream cheese on it, pass me a slice please! 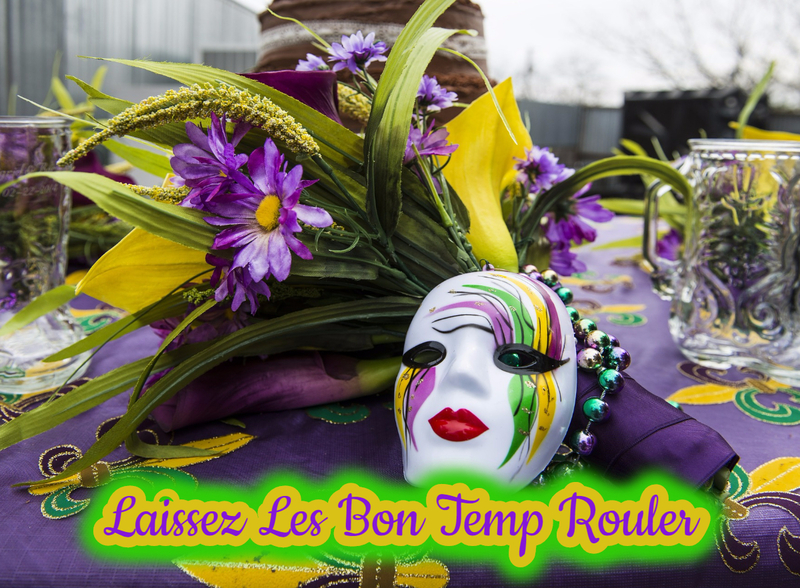 This looks like a fun recipe for Mardis Gras! Yowsers now that is a colourful loaf, looks great and fab flavour combinations. Maybe proofing it longer might make it fluffy or xantham gum. Such a fun idea making it into bread rather than a cake! Genius! Wow - now that's a Mardi Gras dessert. And love the cinnamon flavor! Your recipes look divine!! This just looks amazing! I'm just so bad at baking unless it's really simple, not sure why. This looks yummy! I love all the colors in the bread that make it look more appetizing too! This bread is so unique! I love it! I bet it tastes just as good as it looks! Woaah, these colours are magical. I love how you went with the Mardi Gras theme. It is just around the corner in only a few weeks. I love this cinnamon swirl bread. I love the rainbow like color. Yummy and tasty! This is such a colorful beautiful cake bread! So festive and perfect for the season! 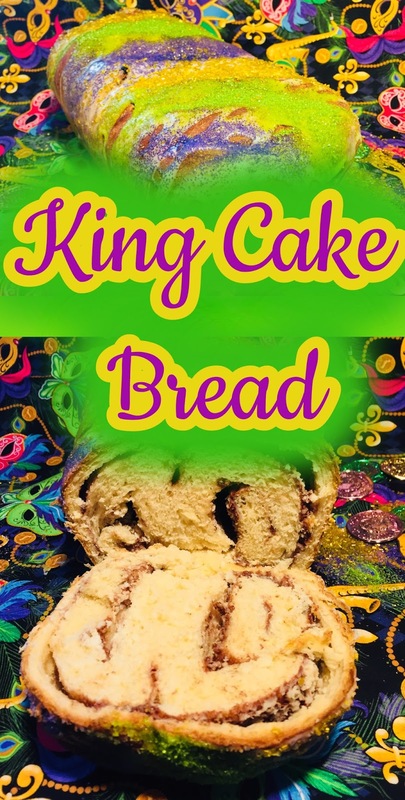 This King Cake Bread looks delightful and perfect for dessert. I really love baking and try new recipes and I will definitely try to make this recipe soon. Oh!! That looks delightful and loving those colorful. and I really like the cinnamon flavor of this king Cake Bread. Your post is certainly colourful for Mardi Gras. Could I just say though, I find reading the white text on black really hard on the eyes, that's the reason you never see websites in these colours. Just something to think about. This is amazing, it looks so yummy and tasty. I would surely try out this recipe! Loved reading about the history behind mardi gras. The cake looks delicious! I had King Cake for the first time a few years ago. One of the assistants brought it in to share with everyone. I was in love. So, I'm so happy to find this recipe! Sharing! I'm trying to be less of sweet tooth lately but still can't ignore trying out new ideas. this looks delicious. ohhh, the colors of the bread looks so good!!! It definitely looks tasty. I like how colorful it is. Great attention to detail! I love King Cake, never occurred to me to make it at home! This looks so so good! I love anything with cinnamon! Cinnamon are my fav but this looks lush too! Quite a colourful cake. Thank you for the recipe definitely something I will try in my kitchen soon. This looks like a fun recipe for kids! it looks just wonderful and based on the ingredients you are using, it must absolutely tasty. This looks so yummy and delicious. Mardi Gras - I think we have a similar thing in Poland, it's called "Tłusty Czwartek" which basically means fat Thirsday. That day, people eat loads of donuts! We eat Pancakes on Mardi Gras. I always look forward to seeing what recipes you conjure up and this latest one just looks magical! I love cinnamon so this is right up my street! Thanks for sharing such a colourful creation. I've never had this, but it sounds like it would be amazing. And My kids would go gaga over the toppings. I have always wanted to celebrate Mardi Gras! It always looks like so much fun. This King's cake looks amazing and I love the different colours on top. So much fun ! Wow, this is the most delicious looking cake I have ever seen! I absolutely have to try this STAT!! Thank you so much for sharing!! We don't celebrate Mardi Gras where I live but I've done reseearch on it before and it looks like such a fun holiday. This banana bread sounds really delicious, I love that you've given it the Mardi Gras colours! Wow! I had no idea Mardi Gras dated back that far! Have you ever tried subbing almond milk for the milk in the cake? Yes, you defiantly can sub almond milk for regular milk. Bright and Tasty just needs the baby! Might try this one. This bread looks so fabulous and I am sure this would be equally delicious too. Oh my gosh, that looks so good! I would definitely give it a try. That looks absolutely delicious! I love homemade sweet breads. I'll have to give this a try! This cake looks amazing. Will try the recipe for my next birthday party. Love it! I was looking for something nice to make for my aunt for her birthday and this sounds like a good idea. Thanks for the recipe. OMG that looks absolutely amazing! Not only does it look pretty but looks delicious as well. I’ll have to try this recipe soon. I've heard about Mardi Gras but I knew nothing about its history. Thanks for sharing! The bread looks delicious! Such a colorful addition to any festival...I love how the swirls look on the finished bread...I do not eat egg but will refer this recipe to my friends who love to bake! The colors are so vibrant! I bet the taste is also great. Loving this an a craft to do with my little one. Trying to get her to experiment with food. Wow, what an eye catching cake! It's almost too pretty to eat but I'm sure I wouldn't be able to resist a piece. Another recipe that looks amazingly tasty and fun to make too! Love the colours on top - would easily have a piece (or two) now! Festive and very colorful recipe! You just need to have your background change. This looks fantastic! Such a great bake! Thanks for sharing. Oh my god, this cake looks amazing, so colourful and fun! It looks yummy too so I will be definitely going to try it! Oh my goodness this bread looks delicious! I have actually never tried to make my own bread before. I will definitely have to give this a try as it looks really good. Thank you for sharing! The bread looks yummm. It is always good to know a little history about food. Bread is my favorite meal anytime and this looks super tasty! I was just about to say how I'm not exactly crazy about bread as they are carbs (me on diet) when I saw your colourful bread! Really like the combination and this makes me happy just by looking at it! Mm! This looks delicious! I love cinnamon on the cake a lot. My best friend’s birthday is around the corner and we will be celebrating it at a fine party venue. I really want to bake a cake for her. She has been my support all my life and I really need to do something special and stupendous for her. Thanks for sharing such an amazing idea.